Looming in quiet splendour over modern Athens is the awe inspiring Acropolis. Best known for housing the iconic Parthenon, it is also home to another mysterious and beautiful temple called the Erechtheum. The Erechtheum was completed in 406 BC, reputedly on the spot where Athena and Poseidon battled for control over Athens. The structure actually unites two separate temples. First the east porch which once sheltered an olive wood statue of Athena, while the second is the west porch which held a statue of Poseidon. Of course, the most famous feature of the Erechtheum is the south porch which is held up by six columns in the shape of voluptuous, drapery-clad maidens. These beautifully carved stone maidens are collectively known as the Caryatids, possibly named after the woman of Caryae, who were famed for their beauty and served as Athenian slaves. It was probably for this reason alone that inspired the Ottoman commanders to convert the Erechtheum temple into a hareem during their occupation! Although the six Caryatids are of the same height, build, and similarly attired and coiffed, they are in fact are not the same. Their faces, stance, draping, and hair have all been carved uniquely. The three on the left stand on their right knee, while the three on the right stand on their left knee. And if you were wondering why they have such large 'French plaits', it is because their bulky, intricately arranged hairstyles serve the crucial purpose of providing static support to their necks. Otherwise this section of the statue be the thinnest and therefore structurally weak. Unfortunately, the six Caryatids the you see on the south porch today are only copies, but the originals still exist. 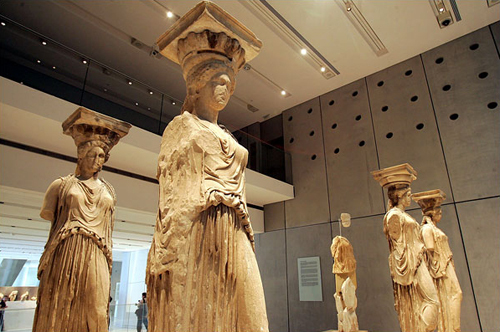 Five are being restored while on display at the new Acropolis Museum, while the sixth was removed by Lord Elgin in the early 19th century and is currently housed in the British Museum in London. The Acropolis housed Caryatids currently stand on a special balcony that allows visitors to view them from all sides. The pedestal for the Caryatid that was removed to London remains empty. The Romans also copied the Erechtheion caryatids, installing copies in the Forum of Augustus and the Pantheon in Rome, and at Hadrian's Villa at Tivoli. For related articles click onto the following links.